There is so much to love about Italy (the art, the history, the fashion, the food!) and each region of the country is just as over-the-top gorgeous as the next. It’s hard to pick a favorite, but Tuscany holds a special place in my heart — with its lush hills and seemingly endless vineyards, I truly believe that the region is one of the most romantic places in the world. As a college student, I was lucky enough to spend a semester living and learning in Florence, and I’ve come to think of it as a home away from home. I have such fond memories of exploring the cobblestone streets with gelato in hand, eating endless amounts of pasta in one amazing restaurant after another, and spending sun-soaked afternoons strolling along the Arno River. To this day, it’s one of my very favorite cities, and I try to relive those experiences every chance I get. Florence and its surrounding landscape are beautiful in a remarkably timeless way, and I wanted to capture that feeling in this semi-custom suite. During the design process, I found myself drawing inspiration from the dreamy cyprus-lined walkways, the classical architecture, the graceful lines of the olive trees. In the end, it was botanic elements that became the focus of the design. The hand-painted illustrations celebrate the organic shapes and natural tones of the region’s olive groves, and they are a wonderful balance to the structural, classic font. THE FLORENCE SUITE pairs beautifully with olive green envelopes and natural jute twine to (literally) tie everything together. The Florence invitation set is available to order in the semi-custom collection — head to the shop to start the ordering process! As always, please feel free to contact me if you have any questions or would like to discuss your custom options. Starting with your save the dates, every piece of stationery that you send into the world is an opportunity to set the tone for your wedding. A colorful invitation suite using casual phrasing will put your guests in an entirely different mindset than if they received a minimalist suite with traditional wording. Odds are you already have a pretty good idea of what your tastes are and what kind of wedding you want to have — and that’s really the most important part! Your stationery designer can use that information and inspiration to bring your vision to life. When it comes to the actual design, there are two main directions that you can go — semi-custom stationery or fully custom design. Below, I’ll go into some details comparing the two options to help you decide what will work best for you. In all honesty, both are great options that can produce beautiful results, so you really can’t go wrong! My goal with semi-custom stationery is to provide a more affordable option without sacrificing quality. Each suite is created with the same love and attention that I put into custom work — the illustrations are still hand drawn, the finished products are printed on the same 120lb paper, and you get the same selection of luxe euro flap envelopes. 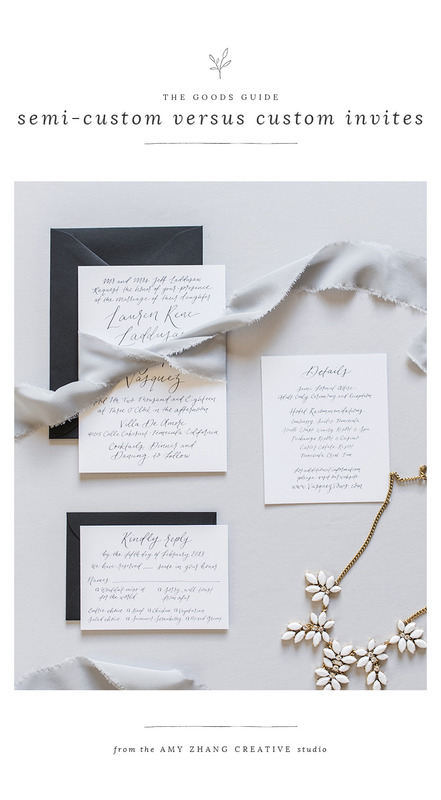 And of course, there are still plenty of ways to make your stationery unique — customize your wording, choose your favorite envelope color, or opt to add on custom calligraphy or illustrations. How to get the most out of your semi-custom suite? Take advantage of the lower price point to go all out with your paper goods, from menus, to a schedule of events, to thank you cards that match your invitations. With custom stationery, every single element is created specifically for you. We begin the process by discussing what you’re envisioning for your wedding, the mood you want to set, the colors and styles that you’re drawn to, etc. This is your opportunity to showcase the things that are special to you as a couple — there are countless options, like a venue illustration for your details card, a crest or monogram that you can use throughout your stationery, or a map of your favorite places around town for your guests. Custom stationery does come with a larger price tag, but if you love paper as much as I do, all the unique details and design elements make the investment well worth it. At the end of the day, it really doesn't matter which option you choose, so long as it fits your story to a tee. Whether you choose semi-custom or custom stationery, remember that you can carry the design elements through to the rest of your wedding day. Have your stationery designer create matching signage, use illustrated elements on your programs, add your monogram to coasters or napkins. Think about your everyday life as a couple, the activities, rituals, and interests that you share with your future spouse — finding a way to feature those things in your invitation suite is such a beautiful, heartfelt way to celebrate your love even more. Most importantly, have fun with it — the possibilities are endless!